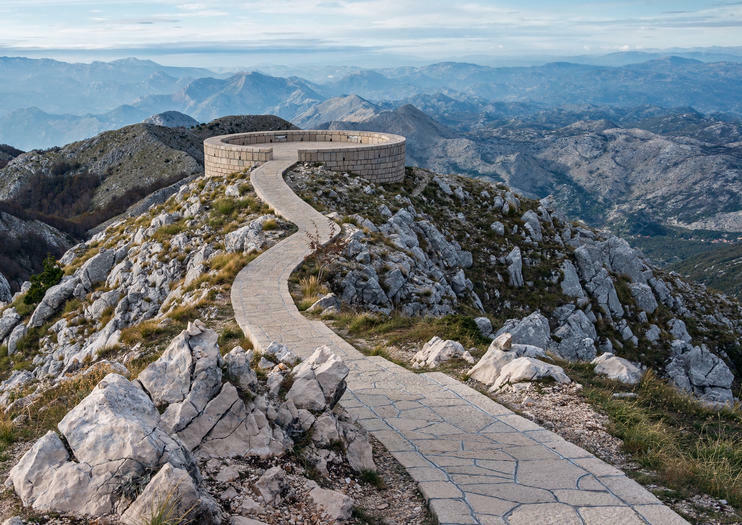 Covering 62 square kilometers in southwestern Montenegro, Lovcen National Park is home to Mount Lovcen, the black mountain that gave Montenegro its name. Located between the sea and the mainland, the park and the mountain feature a mix of Mediterranean and Continental climates and, thus, a wide variety of flora and fauna. The most notable monument in the park is the mausoleum of Petar Petrovic Njegos, a prince-bishop of Montenegro, poet and philosopher. On the summit of Jezerski Peak, the mausoleum is at the end of a 461-step path and offers views as far as Albania and Croatia on clear days. The park is also home to the Ivanova Korita resort on the eastern slope of Jezerski Peak. There, you can find restaurants and hotels, as well as a small ski slope in the winter. The most popular activities in the park are hiking in the summer and Nordic skiing in the winter. Lovcen National Park is just 14 kilometers from Cetinje, 32 kilometers from Budva and 45 kilometers from Kotor. The best way to get there is by driving, taking a taxi or booking a tour. The Njegos Mausoleum is open daily from 8am-6pm and admission is an additional 3 Euro. A photographer is stationed near the entrance for visitors to take photos in period costumes for an extra charge. The dramatic mountain of Lovcen rises above Montenegro's coastal region and provides the backdrop of the city of Kotor. The mountain is a national park, and includes the highest and central point of the Lovcen massif.This 5-hour tour includes a visit to Njegos Mausoleum, where the great Montenegrin poet and philosopher Petar Petrovic Njegos is buried. The mausoleum is located on top of Mt. Lovcen at the summit of Jezerski vrh, with an altitude of 1,675 meters. The foundation of the mausoleum is less than six feet deep in the mountain rock. To get there, you must climb 461 steps – so be prepared for some exercise.